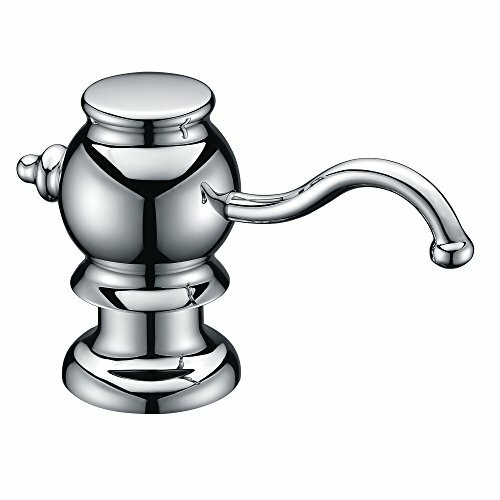 Shinning Luxury Sturdy Solid Brass Pump Head Kitchen Sink Soap Dispenser, Dish Soap Dispenser, Hand Soap Dispenser. Advantages: Solid sturdy and healthy material, high quality control, easy installation design. Components:Lead-Free Solid Brass Pump Head and Nozzle, rubber washers, metal threaded tube, transparent PE plastic bottle. Key Features: Polished Chrome Finish, volume 320 ml / 11 oz liquid soap bottle. Thickness of installation surface should not beyond 30mm. For soap dispenser, we provide 1 year warranty. You can get free replacement if any quality issue happened. We provide 7 * 24 mail service in Amazon. Any question, suggestion or issue, please contact us directly. Normally, you¡¯ll get reply in 24 hours. We¡¯ll do our best to give you the best solution . Made of genuine solid brass pump head, over 400 gram, much better than those plastic ones. Unique fascinating design, shinning bright chrome surface, dust and rust resistance. Easy to install, just screw in and go, self-priming pump swivels 360-Degree, refill from top. Best partner of chrome kitchen faucet, please note, it might bigger and heavier than you suppose, please check the size before purchase. Risk free guarantee, any issue, contact us directly. 1 Year Warranty by HUASONG. If you have any questions about this product by SUCASA, contact us by completing and submitting the form below. If you are looking for a specif part number, please include it with your message.